On our Portugal Viking River Cruise, we took an excursion to see one of the local vineyards. 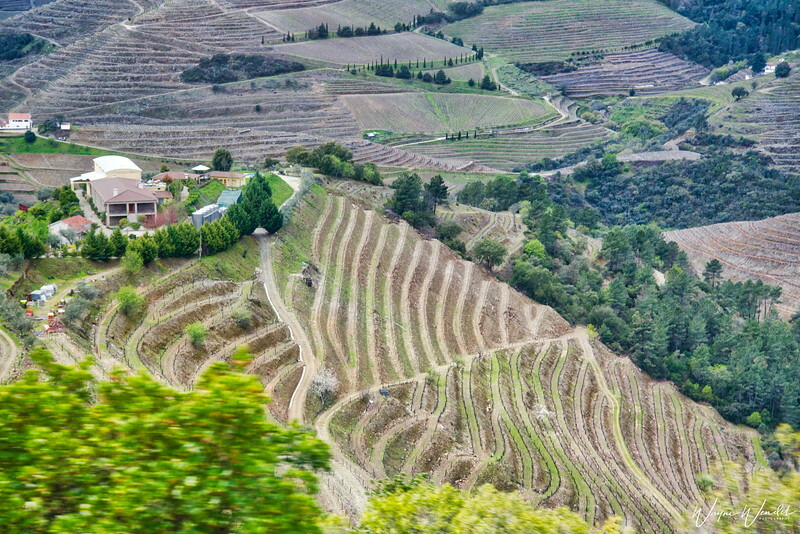 As the bus headed north from Pinhao and climbed up from the Douro River valley and right through the heart of the port wine producing vineyards. I was in awe as looked at how these farmers use almost every square foot of ground to grow the grapes. Our tour that day was to the only region that produces muscatel wine. Probably even if there was a will to stop, there wouldn't have been a way - not a safe one, anyway. I'm guessing you were on a narrow winding road. Still your shot conveys the essence of the terrain and its use. I have taken so many photos from moving vehicles that I totally understand the sort of frustration. Nevertheless, this is a great shot of the vineyards. Wonderful pov...love all the lines of the terraces! The air in Colorado is not quite as crisp as usual, due to all the fires in the western U.S.
Great view of all the vineyards cascading down the hills!